This Contest Ended on February 28, 2010. You cannot enter any more. The winner of the Apple iPod Touch was Bonnie F. from Castro Valley, CA. Her review of HSN.com was randomly selected as the winner. Again, writing multiple reviews really enhances your odds of winning these contests. Bonnie wrote 10 different merchant reviews for BestOnlineCoupons.com. Hot Contest: Win a brand-new Apple iPod Touch! Recently, we gave away a Dell XPS 16 laptop to a lucky winner, and now we have another exciting contest. This time the prize is an iPod Touch. 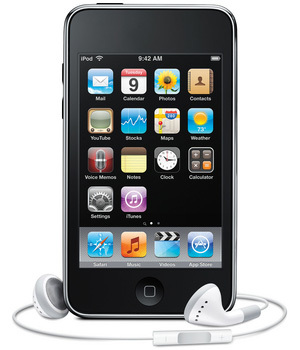 One lucky winner in this contest will win a new Apple iPod Touch from BestOnlineCoupons.com. All you have to do to enter is submit a review of a merchant listed on this website. It is our way of rewarding you for sharing your shopping experience, so we get more real consumer reviews to share on our coupons site. Each quality review submitted between January 12, 2010 and February 28, 2010 is an entry into the contest (one will be randomly selected as the winner from the entries received.) So submit reviews of all the the online stores and Internet services you know about to increase your chance of winning. However, only review those merchants that you have personal shopping experience with, to keep our reviews as accurate and useful as possible. It is very easy to submit a review of a merchant. You do not even need to register or anything. However, you'll want to include a valid email address (it will not be published, sold or added to any list) so that we can contact you for your shipping address if you win. If the email address for the winning review doesn't work, or we do not receive a reply within 7 days of notifying the winner, the prize will be awarded to another randomly picked winner instead. Perhaps you are looking to buy an Apple iPod Touch? For free shipping deals and discount offers from Apple Store, see our Apple Store Coupons. Apple iPods are also sold at many other online stores including Best Buy, Target, Walmart, B&H Photo Video, and Tiger Direct. Timing. The contest starts at 12:01 AM CST on January 12, 2010. The contest ends at 11:59 PM CST on February 28, 2010. All reviews must be submitted during this time period to qualify as entries into the contest. Selection of Winner. On or about March 1, 2010, one potential winner will be selected by randomly choosing one of the published reviews. If that person and the review meet the elgibility criteria, they will be awarded the prize. If their email address is not valid or they do not respond to the notification within seven (7) days, the prize award will be rescinded. This procedure will be repeated as necessary until there is one (1) eligible winner that has claimed the prize. Prizes. One (1) prize will be awarded. The approximate retail value of the prize is $200. No prize substitution, cash redemption, assignment or transfer of prizes by winner is permitted. We reserve the right to substitute a prize with another prize of equal or greater value. Limit of one prize per person. BestOnlineCoupons.com has been the online coupons site that many people throughout America have turned to many years. We've helped Americans save a ton of money by listing discount codes, promo deals, online sales, special offers and Internet promotions for thousands of different stores. However, we also want to help people find the best stores to shop at. As more and more stores become available for online shopping, it has become harder and harder to know which are best. Now we are providing these merchant reviews to help our visitors find the best shopping sites. It also provides you with a chance to sumit your own opinions to share with the world, and perhaps win a new Apple iPod Touch in the process of sharing your shopping experience.